A small town Yoga studio, with big city quality. That is how I started in Yoga: coerced, cajoled, however I may want to describe the conversation that led to an incredible change in my life. It came from a dear friend who cared for my well-being. She became my mentor for Yoga. I had been dedicated to backpacking and mountain biking my entire adult life. My work was mostly upper body torqueing, muscle, joint and tendon straining. My back was a total mess, stemming from a debilitating fall that occurred while mountain biking on the Appalachian Trail in Vermont before the craze went viral. The results were a severe neck injury that wrecked havoc on my entire back and took decades to heal. I didn’t believe in stretching. I just hit the trail on my bike or with a 40LB backpack for days of crossing mountain passes; every moment just bearing the pain. A small price to pay. Right??? In the beginning, I could hardly stand straight, or bend over, or lay flat, or sit up straight without accompanying layers of pain and of course, embarrassment. The other folks doing the Yoga were not even looking at me but I was looking directly at this wretched creature in the mirror who could not do any of the poses even remotely close to their intended positions. I hated it at first, but not because of the pain. It was due to my inadequacy and my silly ego pride. Months went by and a slow transition occurred. I was able to forgive myself for being incapable. My practice taught me one thing at first and that was to let go of all pretenses and really just go with the flow. After 6 months or so I could finally see a faint glow of hope and a light appeared in my body/brain connection. A realization occurred that my body was slowly gaining on a reversal of that havoc that created so much pain in my life. It released me from the angst of trying and delivered me to a state of actually doing. A flow of resiliency started to take effect. The poses became much more than a mere challenge. My body responded with a sigh of relief and my inner life felt a sanction that I had always sought in my every day life. Backpacking and hiking in the woods was a meditation for me. My inner landscape became one with nature. The trees were very forgiving and kind. I worked on blending my presence with all that was natural in life. This worked just fine when I was in the mountains. The peace ebbed when I returned to civilization. The monkey mind always surfaced and once again I was cursing the people who couldn’t drive according to my standards. Things have changed. Tranquility now has its place in my day to day life. Life has become a practice of sorts. My time on the Yoga mat has transformed this wracked, impatient creature into a more compassionate and peaceful individual. The practice of folks like Iyengar have become my goal. I realize that he started Yoga in his teens and continued to teach into his nineties. I started in my sixties and want to continue and teach into my nineties. I take classes, mostly with women who are stronger and much more resilient than I could ever be. My goals are slowly being reached because of a dedication to my practice. All of these folks that I practice with are mentors and I am thankful for having landed here, in Port Angeles and at this Yoga studio. Years ago, I started out with Bikram Yoga and gravitated towards the Hot Yoga classes, but realize now that so much of my own resiliency is a result of the Yin and Restorative classes. The instructors here, at Poser YOGA are my inspiration to want to teach Yoga. So….. I’ve committed to taking a Yoga Teacher Training in Barcelona for the month of May with a lead-in of two weeks prior in order to become more prepared for the 200-hour intensive!!! Then 1 week of beach on the Med. At first I was full of extreme apprehension and self-doubt. The instructors here, especially Jenny, have done nothing but encourage me to do this. 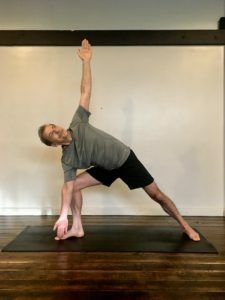 My goal is to come back into the area and teach, to bring more men onto the Yoga mat and to encourage the older folks in our community to move around and strengthen their aging bodies. This is something I know so well. Namaste, and see you on the mat.